Background: Hepatitis C virus (HCV) is an important hepatotrophic virus known to be transmitted percutaneouly through contaminated sharp objects, blood and blood products. 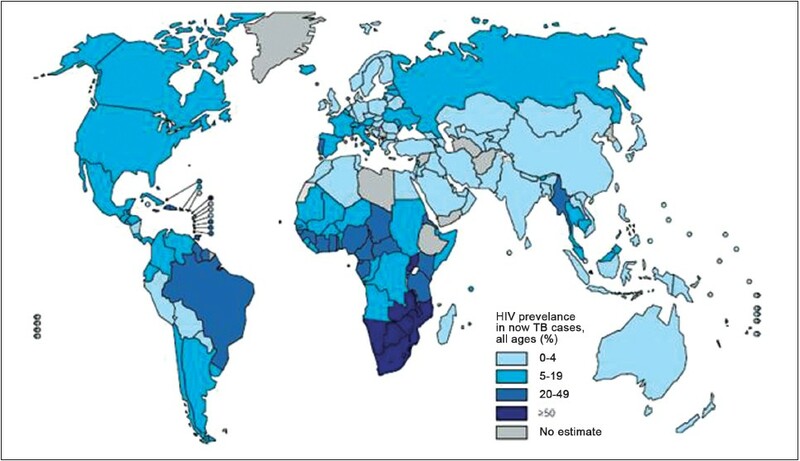 Blood transfusion is a major risk factor for the acquisition of HCV in sub-Saharan Africa and it is attributable to the absence of consistent screening of blood donors. Children and adults are all at risk of being infected especially those with sickle cell disease. Objective: To determine the seroprevalence of hepatitis C viral antibodies among transfused sickle cell anemia (SCA) children. Materials and Methods: Three hundred (300) SCA children aged 6 months-15 years attending the SCA clinic and on admission in emergency pediatric unit (EPU) and pediatric medical ward (PMW), (both in steady state and in crises) of Usmanu Danfodiyo University Teaching Hospital, Sokoto, were screened for hepatitis C infection using anti-HCV as marker of infection and the sensitive enzyme-linked immunosorbent assay method was used for detection of the marker. Three hundred (300) children with minor illness attending pediatric outpatient department and on admission in for various treatment of the same hospital served as gender- and age-marched controls. Results: The result showed that the prevalence of anti-HCV seropositivity for HCV infection among SCA children was 12.7% (38/300) compared with 10.3% (31/300) of the control (P = 0.958). The prevalence of HCV infection increases significantly with increase in frequencies of blood transfusions both in SCA children (P = 0.0001) and the controls (P = 0.0001). 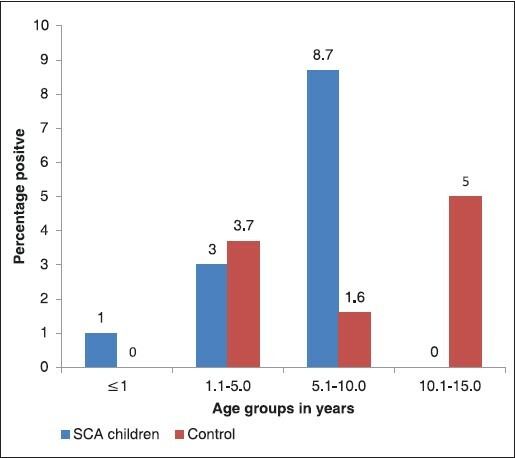 Other risk factors for HCV infection such as traditional scarification (SCA 4 out 12, controls 4 out 16) and injections (SCA 38 out of 168, controls 27 out 172) significantly affect the prevalence of HCV infection in both SCA children and controls, (P = 0.0001). Conclusion: The prevalence of HCV infection in both SCA children and controls is high and the higher the frequency of blood transfusions the greater the rate of HCV infections. Background: The plasma levels of C-reactive protein (CRP) within the reference interval have been shown to be a strong predictor of coronary heart disease (CHD) and are being considered in cardiovascular disease risk assessment. And for effective utilization of CRP in this regard, its distribution among healthy individuals in the general population should be established, using the high-sensitivity CRP (hsCRP). Aim: The aim of this study was to describe the plasma distribution of hsCRP concentration in healthy adult Nigerians and to estimate the proportions of those at high risk for cardiovascular disease. 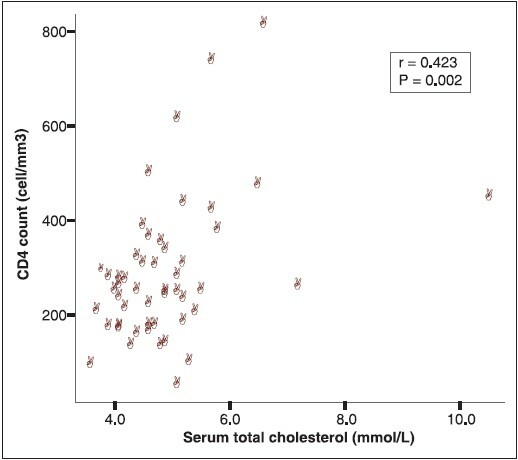 Materials and Methods: hsCRP glucose, total cholesterol, high-density lipoprotein-cholesterol (HDL-C), low-density lipoprotein-cholesterol (LDL-C) and triglycerides were measured in 120 adult Nigerians free of clinical and biochemical features, suggestive of cardiovascular disease and not on any form of hormonal therapy. The blood pressure, height and weight of the participants were also measured. hsCRP was measured by synthron CRP ultrasensitive enzyme-linked immunosorbent assay method, glucose was measured by the glucose oxidase method, while the lipid profile parameters were measured by enzymatic colorimetric methods. Results: hsCRP concentration ranged from 0.62 to 11.64 mg/L (median: 1.3 mg/L, mean: 2.3 mg/L, 95% confidence interval, 0.75-11.0 mg/L). About 81.7%, 15.0%, and 3.3% of the participants had hsCRP concentrations of less than 3 mg/L, 3-10 mg/L, and higher than 10 mg/ L, respectively. The plasma levels of glucose and lipid profile parameters were within the reference limits established at the Chemical Pathology Laboratory of Aminu Kano Teaching Hospital (AKTH). None of the participants was obese (mean body mass index was 18.6 kg/m 2 ). 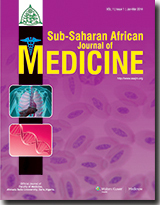 Conclusion: This study describes the plasma distribution of hsCRP in healthy Nigerian adults. The results obtained would be of further help in the risk-assessment of individuals for future cardiovascular disease. Background: Myelodysplastic syndromes (MDS) are the most common of myeloid malignancies, yet the morphological diagnosis is usually not straightforward especially in the low-grade forms. Immunophenotyping by Flow cytometry (FCM) is considered essential in the WHO's co-criteria for diagnosis of MDS. 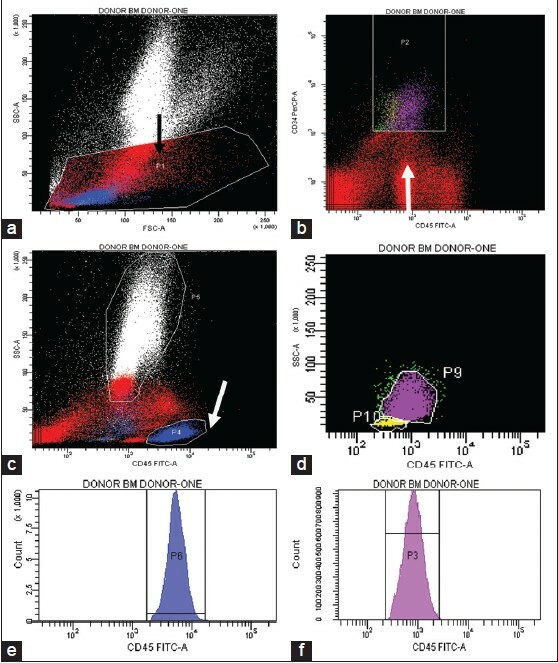 The Existing FCM Protocol utilizes a two-tube, two-colour approach to identify lineage specific cluster of differentiation (CD) markers, which is labour-intensive and time-consuming. A new FCM was recently developed and validated among Japanese cohorts. It utilizes a three-tube, five-colour approach and generates more information in the form of 'cardinal parameters'. The aim of this study is to determine the diagnostic utility of the new protocol by comparing it with the existing protocol, in the diagnosis of low-grade MDS in our study population. Materials and Methods: We analyzed bone marrow samples of 30 subjects at King's, London. They comprised of 27 patients who had a tentative diagnosis of MDS and three healthy bone marrow donors as controls. Immunophenotyping by FCM was performed using the Existing and New Protocols and the data obtained by the two different methods were compared. 'Cardinal parameters' were generated in the new protocol, which are not applicable to the existing protocol. Results: There was no statistical difference between the data generated by the two protocols in the diagnosis of MDS. The sensitivity and specificity of the 'cardinal parameters' of the new protocol appeared to be outstanding. Conclusion: It has been shown that the new multiplex FCM protocol for the diagnosis of MDS is relatively easy, cost effective and not inferior, compared to the Existing Protocol. However, small sample size has been identified as a limitation to the study and therefore a larger, multicenter study is recommended to assess this validation exercise. This article presents the clinical manifestation of Norcardial infection in the setting of iatrogenic immunosuppression. 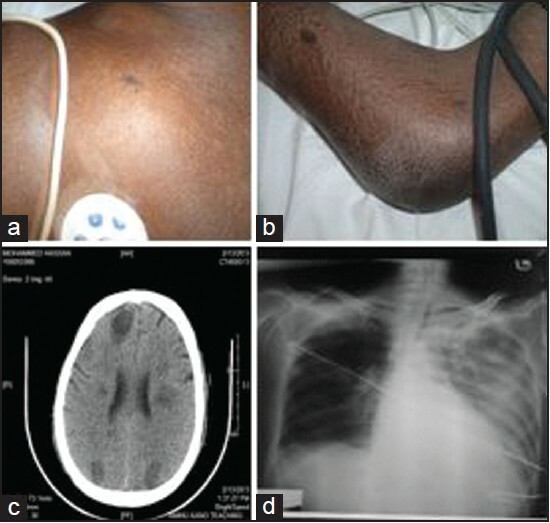 The patient suffered from myasthenia gravis for which he received a prolonged course of high dose steroid. At the time of presentation he had lesions in the brain, lungs, and soft tissue consistent with Norcardial infection. He developed disseminated intravascular coagulopathy (DIC) and acute kidney injury (AKI) and died on the 12 th day in intensive care unit (ICU). Mycobacterium riyadhense was first isolated in 2009. Five additional cases were reported since then. This is, however, the first case of M. riyadhense with human immunodeficiency virus coinfection in the literature. A 54-year-old male diabetic presented with 4 months history of diarrhea, productive cough, odynophagia, and dysphagia with progressive weight loss. He looked cachectic with oropharyngeal thrush, bilateral axillary lymph node enlargement and herpes zoster involving the first two thoracic dermatomes. He had right-sided consolidation on chest examination. 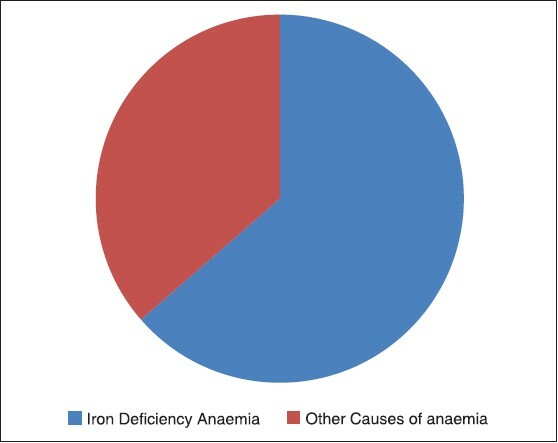 He was anemic with a normal platelet count. Sputum examination was positive for acid-fast bacilli (AFB); however, deoxyribonucleic acid probe-detection assay for MTB (complex) was negative. The isolate was confirmed as M. riyadhense at the Bioscientia laboratories (Ingelheim, Germany). Stool was positive for Clostridium difficile toxins by polymerase chain reaction (PCR). Human immunodeficiency virus (HIV) test was also positive. The patient showed improvement in clinical, bacteriologic, and immunologic parameters with antituberculous and antiretroviral medications. The lesson from this case is for clinicians to suspect infection with atypical mycobacteria once mycobacterium tuberculosis (MTB) PCR is negative in a patient with a positive smear for AFB so that appropriate therapy for nontuberculous mycobacterial disease can be initiated early.